For the low-carb or Paleo family, breakfast can be a challenge. Even gluten-free families get tired of trying to avoid standard American breakfast choices. In our case, we are avoiding both grains (not just gluten) and eggs, so that eliminates cereals and omelette-type dishes. Luckily, we've found a good number of interesting meat-based breakfast dishes that everyone likes! The key is making big batches ahead of time and freezing them. Who wants to cook for an hour first thing in the morning? 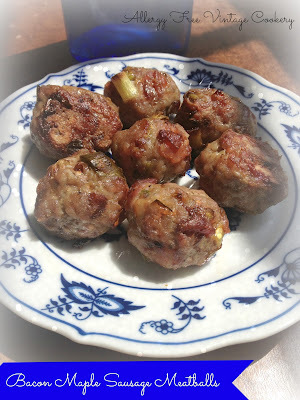 These Bacon Maple Sausage Meatballs are simple and easy to make in the oven. There's one extra prep step -- pre-cooking the bacon before you mix it into the meatballs -- that's really worth it. If you add raw bacon to the meat it won't cook through and you'll be left with chunks of fat in your meatballs. After that quick step, though, it's easy. Just dump everything in a bowl, mix, roll into balls, and let bake. Dice the bacon and cook with the leeks in a small frying pan over medium heat until crispy. Meanwhile, mix the rest of the ingredients in a large mixing bowl. Add the bacon and leeks when cooked, and mix well. Shape into walnut-sized balls on one or two un-greased baking sheets. Bake 30 minutes at 375 degrees, or until dark brown and caramelized. I am pretty sure these could be a family favorite! I will be featuring them next week Lisa! You had me at bacon! Ha ha! Your Bacon Maple Sausage Meatballs sound delicious. What a lovely combination of flavours. I really like the addition of the allspice. Bacon and sausage...can't go wrong! If you have any desserts you love, we'd love for you to come over to our newest link party over at The Inspiration Network: DELISH- a desserts only link party. Bring your desserts and let's party!! I love this recipe! I've been making a maple apple version and wondered if you would allow me to post it to my blog, but of course, directing people to your site for the original recipe. Thank you so much for this recipe! I've been making it into patties and then freezing them to pull out and bake in my toaster oven a few mornings a week. It's made my AIP journey much easier. I don't feel like I'm missing so much! Thank you! Thank you! Yum, This sounds wonderful. Thanks for posting again at Healing With Food Friday. Please come back again. (And I am still raving about the lasagna from last week with the cauliflower ricotta!! I am making that one again. How many meatballs, or servings, does this make?